The Willoughby AS-S3060ADAF Aquasurf® Solid Surface 30x60 ADA-Compliant Roll-in Shower Base, w/ Integral Front Trench Drain, is a single-user fixture for use in commercial, healthcare, and other environments. Willoughby Aquasurf® shower bases are constructed of Aquasurf® cast polymer resin, a stain-, impact-, and burn-resistant solid surface material. Standard AS-S3060ADAF shower bases features include integrally molded underside bracing; sloped, textured floor; integral perimeter flanges, threshold, and curb; heavy gauge stainless steel trench grate; and 2” O.D. no-hub drain. The front drain is available in Left, Center, or Right configurations. The AS-S3060ADAF shower bases can be supplied with optional color-matched solid surface wall panel components (installation by others) for finishing a complete shower area enclosure. All connections between the outside plumbing and the AS-S3060ADAF shower base are made underneath the fixture. The Willoughby AS-S3636ADAF Aquasurf® Solid Surface 36x36 ADA-Compliant Transfer Shower Base (ADA Shower Pan), w/ Integral Front Trench Drain, is a single-user fixture for use in commercial, healthcare, and other environments. Willoughby Aquasurf® shower bases are constructed of Aquasurf® cast polymer resin, a stain-, impact-, and burn-resistant solid surface material. 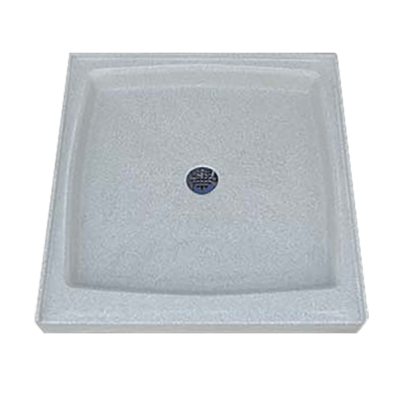 Standard AS-S3636ADAF shower bases features include integrally molded underside bracing; sloped, textured floor; integral perimeter flanges, threshold, and curb; heavy gauge stainless steel trench grate; and 2” O.D. no-hub drain. 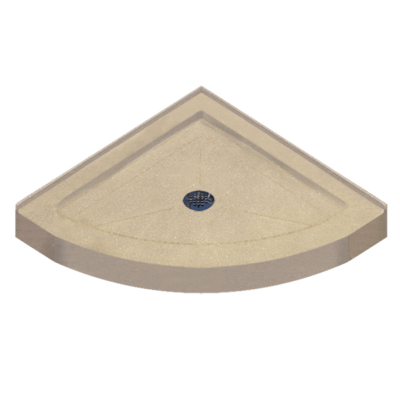 The front drain is available in Left, Center, or Right configurations. The AS-S3636ADAF shower bases can be supplied with optional color-matched solid surface wall panel components (installation by others) for finishing a complete shower area enclosure. All connections between the outside plumbing and the AS-S3636ADAF shower base are made underneath the fixture. 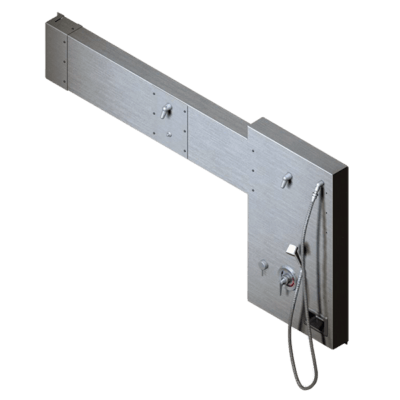 The Willoughby CWBIS-FA Front Mounted Built-in Shower is a single-user fixture for use in commercial environments with or without an accessible mechanical chase. Willoughby front mounted shower plates are fabricated from 14 gauge, Type 304 stainless steel polished to a #4 satin finish. Standard CWBIS-FA fixtures come with one selected shower head and one selected valve assembly, with anchoring through the component shower plates (2 plates included, anchoring and adequate backing by others). 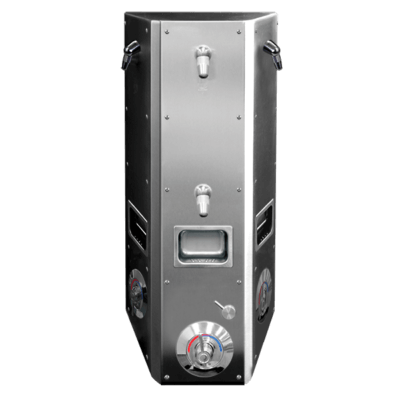 The CWBIS-FA built-in shower can be supplied with a variety of optional features including: valves, controls, plumbing, in-wall accessories, etc. All connections between the outside plumbing and the fixture are made behind the vandal-resistant, stainless steel plates. The CWBIS-FA built-in shower components can be installed to meet most ADA accessibility guidelines when mounted at the correct applicable heights above the finished floor (installation by others). The Willoughby CWSMS-ADA-WH Wide Housing, ADA-Compliant, Surface Mounted Wall Shower is a single-user fixture for use in commercial environments with or without an accessible mechanical chase. Sloped-top CWSMS-ADA-WH wide housing shower fixtures are fabricated from riveted 18 gauge, Type 304 stainless steel polished to a #4 satin finish. Standard CWSMS-ADA-WH fixtures come with two selected shower heads and valve assembly, with anchoring through the included Z-clip and mounting flange (anchoring hardware and adequate backing by others). The CWSMS-ADA-WH shower can be supplied with a variety of optional features including: valves, controls, plumbing, etc., all factory-installed within the shower fixture (unless noted). 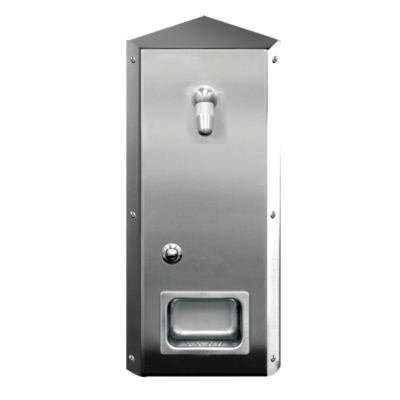 All connections between the outside plumbing and the fixture are made within the vandal-resistant, stainless steel cabinet. The CWSMS-ADA-WH shower fixture meets all ADA accessibility guidelines when mounted at the correct applicable height above the finished floor. The Willoughby CWSMS-HCA Handicap Accessible Surface Mounted Wall Shower is a single-user fixture for use in commercial environments with or without an accessible mechanical chase. Sloped-top CWSMS-HCA shower fixtures are fabricated from riveted 18 gauge, Type 304 stainless steel polished to a #4 satin finish. Standard CWSMS-HCA fixtures come with two selected shower heads and valve assembly, with anchoring through the included Z-clip and mounting flange (anchoring hardware and adequate backing by others). The CWSMS-HCA shower can be supplied with a variety of optional features including: valves, controls, plumbing, etc., all factory-installed within the shower fixture (unless noted). All connections between the outside plumbing and the fixture are made within the vandal-resistant, stainless steel cabinet. The CWSMS-HCA shower fixture will meet most, but not all, ADA accessibility guidelines (see shower model CWSMS-ADA for complete ADA compliance). The Willoughby CWSMS-HCA-WH Wide Housing Handicap Accessible Surface Mounted Wall Shower is a single-user fixture for use in commercial environments with or without an accessible mechanical chase. Sloped-top CWSMS-HCA-WH wide housing shower fixtures are fabricated from riveted 18 gauge, Type 304 stainless steel polished to a #4 satin finish. 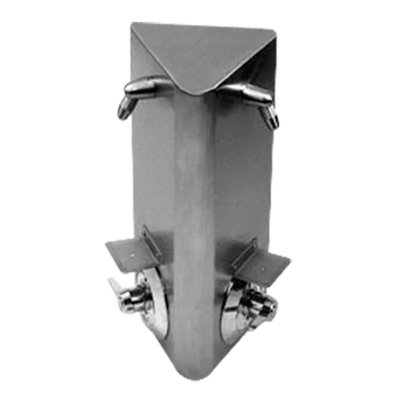 Standard CWSMS-HCA-WH fixtures come with two selected shower heads and valve assembly, with anchoring through the included Z-clip and mounting flange (anchoring hardware and adequate backing by others). The CWSMS-HCA-WH shower can be supplied with a variety of optional features including: valves, controls, plumbing, etc., all factory-installed within the shower fixture (unless noted). 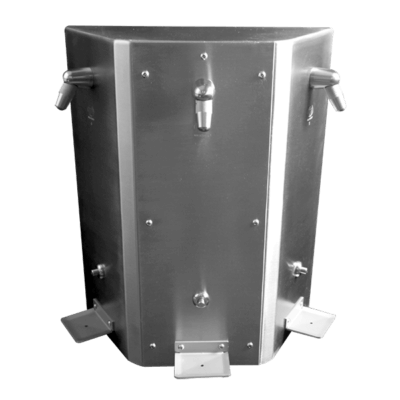 All connections between the outside plumbing and the fixture are made within the wide housing, vandal-resistant, stainless steel cabinet. The CWSMS-HCA-WH shower fixture will meet most, but not all, ADA accessibility guidelines (see shower model CWSMS-ADA-WH for complete ADA compliance). The Willoughby AS-Series Aquasurf® Solid Surface Corner Shower Base is a single-user fixture for use in commercial, healthcare, and other environments. Willoughby Aquasurf® corner shower bases are constructed of Aquasurf® cast polymer resin, a stain-, impact-, and burn-resistant solid surface material. Standard AS-Series corner shower bases feature integrally molded underside bracing; sloped, textured floor; integral perimeter flanges and threshold; and corner-oriented, 2” O.D. no-hub drain assembly. The AS-Series shower bases can be ordered in 36” x 36” Neo-Angle style (AS-S36NEO), 42” x 42” Neo-Angle style (AS-S42NEO), or 36” x 36” Round corner style (AS-S36RND) sizes. AS-Series shower bases can be supplied with optional color-matched solid surface wall panel components (installation by others) for finishing a complete shower area enclosure. All connections between the outside plumbing and the AS-Series shower base are made underneath the fixture. The Willoughby AS-Series Aquasurf® Solid Surface Shower Base is a single-user round corner shower fixture for use in commercial, healthcare, and other environments. 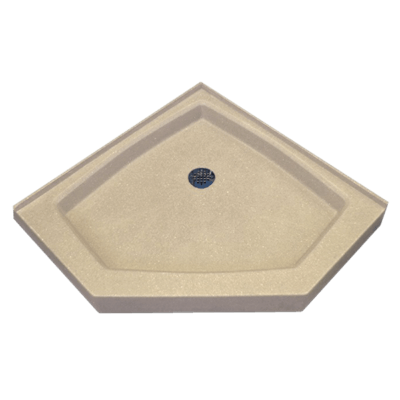 Willoughby Aquasurf® corner shower bases are constructed of Aquasurf® cast polymer resin, a stain-, impact-, and burn-resistant solid surface material. Standard AS-Series corner shower bases feature integrally molded underside bracing; sloped, textured floor; integral perimeter flanges and threshold; and corner-oriented, 2” O.D. no-hub drain assembly. The AS-Series shower bases can be ordered in 36” x 36” Neo-Angle style (AS-S36NEO), 42” x 42” Neo-Angle style (AS-S42NEO), or 36” x 36” Round corner style (AS-S36RND) sizes. AS-Series shower bases can be supplied with optional color-matched solid surface wall panel components (installation by others) for finishing a complete shower area enclosure. All connections between the outside plumbing and the AS-Series shower base are made underneath the fixture. The Willoughby AS-Series Aquasurf® Solid Surface Square / Rectangular Shower Base is a single-user fixture for use in commercial, healthcare, and other environments. Willoughby Aquasurf® shower bases are constructed of Aquasurf® cast polymer resin, a stain-, impact-, and burn-resistant solid surface material. Standard AS-Series shower bases feature integrally molded underside bracing; sloped, textured floor; integral perimeter flanges and threshold; and centered, 2” O.D. no-hub drain assembly. The AS-Series shower bases can be ordered in 36” x 36” (AS-S3636), 36” x 48” (AS-S3648), or 36” x 60” (AS-S3660) sizes, all with square or rectangular profiles. AS-Series shower bases can be supplied with optional color-matched solid surface wall panel components (installation by others) for finishing a complete shower area enclosure. All connections between the outside plumbing and the AS-Series shower base are made underneath the fixture. The Willoughby AS-S3060ADA Aquasurf® Solid Surface ADA Roll In Shower Base, w/ Integral Rear Trench Drain, is a single-user 30 x 60 shower base for use in commercial, healthcare, and other environments. Willoughby Aquasurf® shower bases are constructed of Aquasurf® cast polymer resin, a stain-, impact-, and burn-resistant solid surface material. Standard AS-S3060ADA shower bases features include integrally molded underside bracing; sloped, textured floor; integral perimeter flanges, threshold, and curb; heavy gauge stainless steel trench grate; and 2” O.D. no-hub drain. The rear drain is available in Left, Center, or Right configurations. 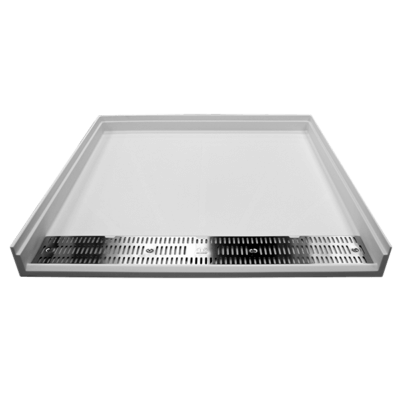 The AS-S3060ADA shower bases can be supplied with optional color-matched solid surface wall panel components (installation by others) for finishing a complete shower area enclosure. All connections between the outside plumbing and the AS-S3636ADA shower base are made underneath the fixture. The Willoughby CWBIS-FA-ADA Compliant Front Mounted, Built-in Handicap Accessible Shower Stall is a single-user fixture for use in commercial environments with or without an accessible mechanical chase. Willoughby front mounted shower plates are fabricated from 14 gauge, Type 304 stainless steel polished to a #4 satin finish. Standard CWBIS-FA- ADA fixtures come with two selected ADA compliant shower head and one selected valve assembly, with anchoring through the component shower plates (2-3 plates included, anchoring and adequate backing by others). The CWBIS-FA- ADA built-in shower can be supplied with a variety of optional features including: valves, controls, plumbing, in-wall accessories, etc. All connections between the outside plumbing and the fixture are made behind the vandal-resistant, stainless steel plates. The CWBIS-FA- ADA built-in shower fixture meets all ADA accessibility guidelines when all components are mounted at the correct applicable heights above the finished floor (installation by others). The Willoughby CWBTBS -Series Back-to-Back Wall Shower is a multi-user fixture for use in commercial environments with or without an accessible mechanical chase. Free-standing Back-to-Back CWBTBS shower fixtures are fabricated in sections, from 16 gauge, Type 304 stainless steel polished to a #4 satin finish. 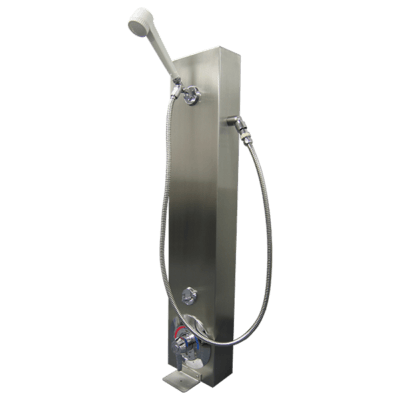 Each shower station on a standard CWBTBS fixture comes with a selected shower head and valve assembly, with anchoring through the included wall mounting brackets and included floor-mounted stanchions (anchoring hardware and adequate backing by others). The CWBTBS shower can be supplied with a variety of optional features including: valves, controls, plumbing, etc., all factory-installed within the shower fixture (unless noted). Shower supply piping is pre-installed to simplify installation, and all connections between the outside plumbing and the separate shower stations are made within or at the wall brackets of the vandal-resistant, stainless steel fixture. Each removable CWBTBS shower station panel is attached w/ security screws, allowing qualified maintenance personnel access to the plumbing equipment within. As CWBTBS Back-to-Back wall shower systems are designed for each specific application, contractors will be required to supply Willoughby with exact field dimensions for the CWBTBS installation before the shower system is manufactured. The Willoughby CWCSY-Series Type Y Column Shower is a multi-user fixture for use in commercial environments with or without an accessible mechanical chase. Free-standing CWCSY column shower fixtures are all-welded, fabricated from 16 gauge, Type 304 stainless steel polished to a #4 satin finish. Standard CWCSY fixtures can be equipped with 2-6 shower stations, each with an individual shower head appropriate valve assembly. The column shower includes a choice of drain fitting, with anchoring is through the included drain fitting and 11 gauge ceiling-mounting ring (drain anchoring bolts provided, ceiling anchoring hardware by others). The CWCSY shower can be supplied with a variety of optional features including: valves, controls, plumbing, etc., all factory-installed within the shower fixture (unless noted). Shower supplies can come from above or below the column, and all connections between the outside plumbing and the separate shower stations are made within or at the wall brackets of the vandal-resistant, stainless steel fixture. The CWCSY shower will typically come with two removable shower station panels attached w/ security screws, allowing qualified maintenance personnel access to the plumbing equipment within. The Willoughby CWCWS-Series Continuous Wall Shower is a multi-user fixture for use in commercial environments with or without an accessible mechanical chase. Continuous, surface mounted CWCWS shower fixtures are fabricated in sections, from 16 gauge, Type 304 stainless steel polished to a #4 satin finish. Each shower station on a standard CWCWS fixture comes with a selected shower head and valve assembly, with anchoring through the included mounting plates and mounting flanges (anchoring hardware and adequate backing by others). 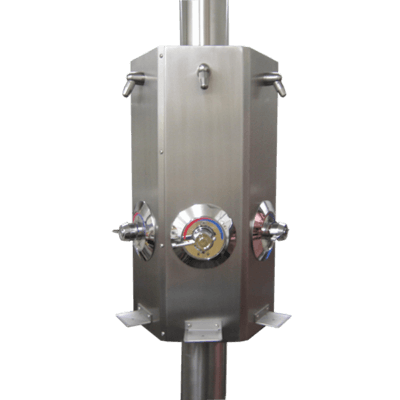 The CWCWS shower can be supplied with a variety of optional features including: valves, controls, plumbing, etc., all factory-installed within the shower fixture (unless noted). Shower supply piping is pre-installed to the included mounting plates to simplify installation, and all connections between the outside plumbing and the separate shower stations are made within the vandal-resistant, stainless steel fixture. Each removable CWCWS shower station panel is attached w/ security screws, allowing qualified maintenance personnel access to the plumbing equipment within. As CWCWS continuous wall shower systems are designed for each specific application, contractors will be required to supply Willoughby with exact field dimensions for the CWCWS installation before the shower system is manufactured. The Willoughby CWDS Two Station, Surface Mounted Wall Shower is a two-user fixture for use in commercial environments with or without an accessible mechanical chase. Surface mounted CWDS shower fixtures are fabricated from 16 gauge, Type 304 stainless steel polished to a #4 satin finish. Standard CWDS fixtures come with one selected shower head and valve assembly per station, with anchoring through the included wall mounting bracket (anchoring hardware and adequate backing by others). 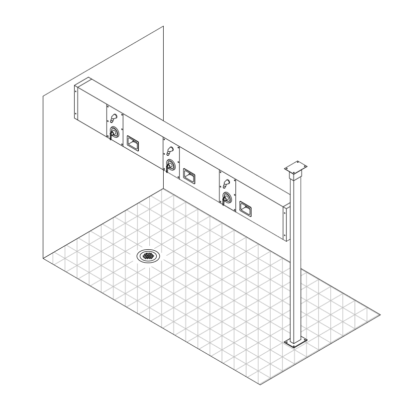 The CWDS two station shower can be supplied with a variety of optional features including: valves, controls, plumbing, etc., all factory-installed within the shower fixture (unless noted). All connections between the outside plumbing and the fixture are made within the vandal-resistant, stainless steel cabinet. Each removable CWDS shower panel is attached w/ security screws, allowing qualified maintenance personnel access to the plumbing equipment within. The Willoughby CWDS-HCA Handicap Accessible, Two Station, Surface Mounted Wall Shower is a two-user fixture for use in commercial environments with or without an accessible mechanical chase. Surface mounted CWDS-HCA shower fixtures are fabricated from 16 gauge, Type 304 stainless steel polished to a #4 satin finish. Standard CWDS-HCA fixtures come with two selected shower heads and valve assembly on the handicap accessible station, one selected shower head and valve assembly on the second station, with anchoring through the included wall mounting bracket (anchoring hardware and adequate backing by others). The CWDS-HCA two station shower can be supplied with a variety of optional features including: valves, controls, plumbing, etc., all factory-installed within the shower fixture (unless noted). All connections between the outside plumbing and the fixture are made within the vandal-resistant, stainless steel cabinet. Each removable CWDS-HCA shower panel is attached w/ security screws, allowing qualified maintenance personnel access to the plumbing equipment within. The CWDS-HCA two station shower fixture will meet most, but not all, ADA accessibility guidelines. Willoughby CWKS Surface Mounted Corner Wall Commercial Showers are single-user commercial shower fixtures for use in commercial environments with or without an accessible mechanical chase. Corner-mounted CWKS shower fixtures are fabricated from 16 gauge, Type 304 stainless steel polished to a #4 satin finish. Standard CWKS fixtures come with one selected shower head and one valve assembly, with anchoring through the included corner mounting bracket (anchoring hardware and adequate backing by others). The CWKS corner shower can be supplied with a variety of optional features including: valves, controls, plumbing, etc., all factory-installed within the shower fixture (unless noted). All connections between the outside plumbing and the fixture are made within the vandal-resistant, stainless steel cabinet. The removable CWKS shower panel is attached w/ security screws, allowing qualified maintenance personnel access to the plumbing equipment within. The Willoughby CWKS-HCA Handicap Accessible, Surface Mounted, Corner Wall Shower is a single-user fixture for use in commercial environments with or without an accessible mechanical chase. Corner-mounted CWKS-HCA shower fixtures are fabricated from 16 gauge, Type 304 stainless steel polished to a #4 satin finish. Standard CWKS-HCA fixtures come with two selected shower heads and valve assembly, with anchoring through the included corner mounting bracket (anchoring hardware and adequate backing by others). The CWKS-HCA corner shower can be supplied with a variety of optional features including: valves, controls, plumbing, etc., all factory-installed within the shower fixture (unless noted). All connections between the outside plumbing and the fixture are made within the vandal-resistant, stainless steel cabinet. The removable CWKS-HCA shower panel is attached w/ security screws, allowing qualified maintenance personnel access to the plumbing equipment within. The CWKS-HCA corner shower fixture will meet most, but not all, ADA accessibility guidelines. 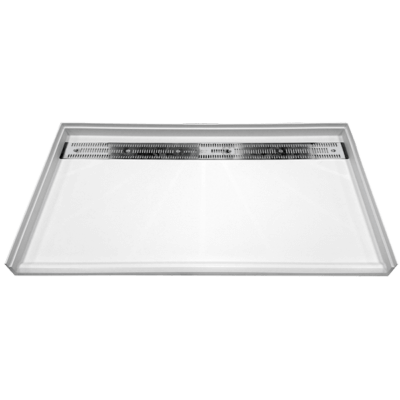 The Willoughby CWRS-FA Front Mounted, Recessed Shower Panel is a single-user fixture for use in commercial environments with or without an accessible mechanical chase. Willoughby front access shower panels are fabricated from 16 gauge, Type 304 stainless steel polished to a #4 satin finish. Standard CWRS-FA fixtures come with a selected shower head and valve assembly, with an 18 gauge galvanized steel mounting frame (shipped separately, anchoring hardware by others). The CWRS-FA shower can be supplied with a variety of optional features including: valves, controls, plumbing, etc., all factory-installed within the shower fixture. All connections between the outside plumbing and the fixture are made behind the vandal-resistant, stainless steel panel. The removable CWRS-FA shower panel is attached w/ security screws, allowing qualified maintenance personnel access to the plumbing equipment within. 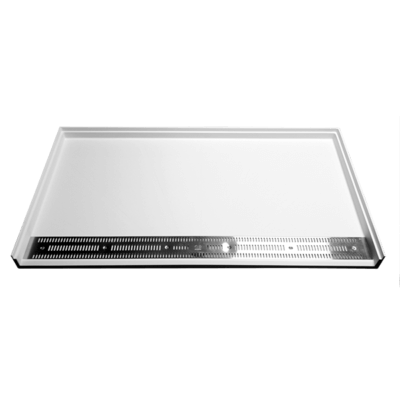 The Willoughby CWRS-FA-ADA Compliant, Front Mounted, Recessed Shower Panel is a single-user fixture for use in commercial environments with or without an accessible mechanical chase. Willoughby front access shower panels are fabricated from 16 gauge, Type 304 stainless steel polished to a #4 satin finish. Standard CWRS-FA- ADA fixtures come with two selected shower heads and a selected valve assembly, with an 18 gauge galvanized steel mounting frame (shipped separately, anchoring hardware by others). The CWRS-FA- ADA shower can be supplied with a variety of optional features including: valves, controls, plumbing, etc., all factory-installed within the shower fixture (unless noted). All connections between the outside plumbing and the fixture are made behind the vandal-resistant, stainless steel panel. The removable CWRS-FA- ADA shower panel is attached w/ security screws, allowing qualified maintenance personnel access to the plumbing equipment within. The CWRS-FA- ADA shower fixture meets all ADA accessibility guidelines when mounted at the correct applicable height above the finished floor (installation by others). The Willoughby CWSMS Surface Mounted Wall Shower is a single-user fixture for use in commercial environments with or without an accessible mechanical chase. Sloped-top CWSMS shower fixtures are fabricated from riveted 18 gauge, Type 304 stainless steel polished to a #4 satin finish. Standard CWSMS fixtures come with a selected shower head and valve assembly, with anchoring through the included Z-clip and mounting flange (anchoring hardware and adequate backing by others). The CWSMS shower can be supplied with a variety of optional features including: valves, controls, plumbing, etc., all factory-installed within the shower fixture (unless noted). All connections between the outside plumbing and the fixture are made within the vandal-resistant, stainless steel cabinet. The Willoughby CWSMSH Hinged Surface Mounted Wall Shower is a single-user fixture for use in commercial environments without an accessible mechanical chase. Hinged CWSMSH shower fixtures are fabricated from riveted 18 gauge, Type 304 stainless steel polished to a #4 satin finish. Standard CWSMSH fixtures come with a selected shower head and valve assembly, with anchoring through the (2) cabinet hinges, secured through the (2) mounting tabs on the opposite side of the cabinet (anchoring hardware and adequate backing by others). The CWSMSH hinged shower can be supplied with a variety of optional features including: valves, controls, plumbing, etc., all factory-installed within the shower fixture (unless noted). All connections between the outside plumbing and the fixture are made within the vandal-resistant, stainless steel cabinet. The Willoughby CWTS Three Station, Surface Mounted Wall Shower is a three-user fixture for use in commercial environments with or without an accessible mechanical chase. Surface mounted CWTS shower fixtures are fabricated from 16 gauge, Type 304 stainless steel polished to a #4 satin finish. Standard CWTS fixtures come with one selected shower head and valve assembly per station, with anchoring through the included wall mounting bracket (anchoring hardware and adequate backing by others). 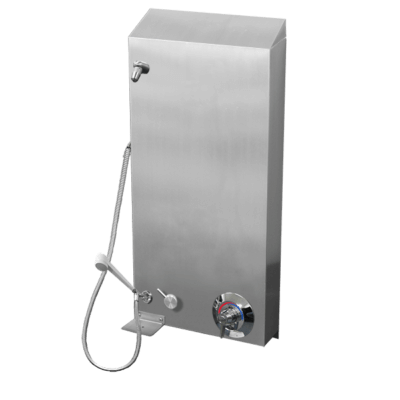 The CWTS three station shower can be supplied with a variety of optional features including: valves, controls, plumbing, etc., all factory-installed within the shower fixture (unless noted). All connections between the outside plumbing and the fixture are made within the vandal-resistant, stainless steel cabinet. 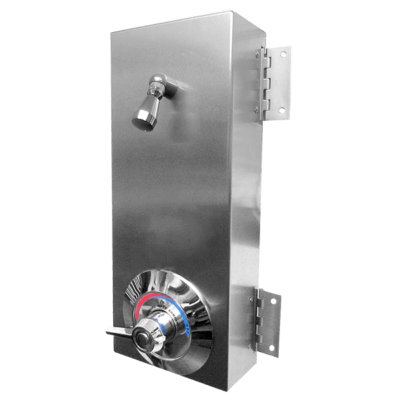 The removable middle CWTS shower panel is attached w/ security screws, allowing qualified maintenance personnel access to the plumbing equipment within. The Willoughby CWTS-HCA Handicap Accessible, Three Station, Surface Mounted Wall Shower is a three-user fixture for use in commercial environments with or without an accessible mechanical chase. Surface mounted CWTS-HCA shower fixtures are fabricated from 16 gauge, Type 304 stainless steel polished to a #4 satin finish. Standard CWTS-HCA fixtures come with two selected shower heads and valve assembly on the handicap accessible station, one selected shower head and valve assembly on the other (2) stations, with anchoring through the included wall mounting bracket (anchoring hardware and adequate backing by others). The CWTS-HCA three station shower can be supplied with a variety of optional features including: valves, controls, plumbing, etc., all factory-installed within the shower fixture (unless noted). 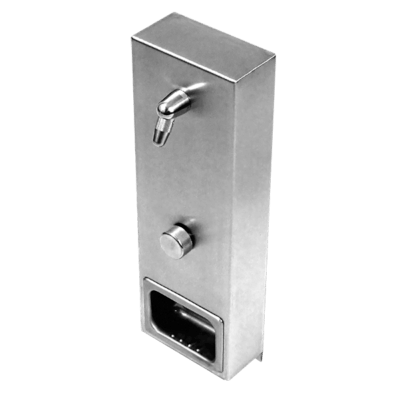 All connections between the outside plumbing and the fixture are made within the vandal-resistant, stainless steel cabinet. The removable middle CWTS-HCA shower panel is attached w/ security screws, allowing qualified maintenance personnel access to the plumbing equipment within. The CWTS-HCA three station shower fixture will meet most, but not all, ADA accessibility guidelines.